The exhibits and shows described below are posted here as a courtesy to local arts organizations and for the convenience of members. They are neither sponsored nor endorsed by the Heritage Fine Arts Guild. Please contact the host group for further information. Cafe Aion in Boulder is seeking two-dimensional artwork for display in their cafe in University Hill – Extended Through September 30 2016. 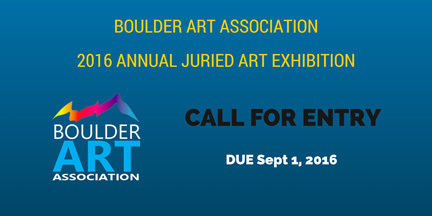 The Boulder Art Association (BAA) is seeking two-dimensional artwork for display at Cafe Aion in University Hill in Boulder, CO. There is no fee for entry. All BAA members are welcome to submit. Artists will be selected by a jury panel chosen by BAA. The owner of Café Aion, Dakota Soifer, has the final decision on which of the selected artists’s works will be displayed. The sixth year of the Art on Loan program for Senator Michael Bennet and second year for Senator Cory Gardner’s Washington D.C. offices, coordinated by the Colorado Artists Guild. Just 4 More Weeks to Enter! All professional and emerging artist are invited to enter your art today! The exhibition dates are November 3-6, 2016 in the expansive gallery space in the beautiful new Hyatt Place Hotel in Boulder, Colorado. The Abbey Events Complex in Cañon City announces a call to artists for the Seventh Annual Religious Fine Art Show opening August 15th, 2016. We are seeking works in a wide range of media and genres, that are religious, (all religions accepted), inspirational or Abbey related in some way. All mediums will be accepted including but not limited to oil, watercolor, pastel, chalk/pencil, printmaking, sculpture, photography, digital art, mixed media, illustrations, fiber art, etc. We're looking for both quality and creativity. Large art pieces are welcome. Professionals as well as artists of all ages are encouraged to enter. We also feature a Children’s Exhibit for children ages 14 & under. Each child is limited to one art piece, $5.00 entry fee. The Entry fee is $30.00 per Artist for the first three pieces; any additional pieces are $3.00 each. Entry fee includes one ticket to the artist reception. There is No Limit on the number of pieces you may enter. Registration and delivery of art pieces may be received anytime during regular business hours beginning July 1 but no later than Wednesday August 10th. Pieces may be delivered to The Abbey at 2951 E. Hwy. 50, Cañon City. The art show will be open August 15th through October 15th, 2016 from 9 am to 4:30 pm Monday through Friday and 10 am to 4 pm Saturdays in The Abbey Monastery. Admission to the art show is free. An artist reception will be held Friday, September 23rd from 5 pm to 7pm, tickets to the Artist Reception are $10 each. A cash “People’s Choice” award will be given in the adult category and children’s category at the artist reception. For additional information please contact Patti Jo Wagner at 719-275-8631 or email Brenda.mckay@theabbeycc.com. The Denver Hospice is excited to announce the dates for our upcoming fundraiser, The Mask Project. This year we celebrate our 10th Project and our 18th year (biannual event). Over this time, we are thrilled to share, The Mask Project has raised upwards of $4.5 million dollars…all in support of our patients and their families through the generosity and participation from supporters like you. The Mask Project 2016 Unconventional Art Auction Display is scheduled for September 12 – October 9, 2016, in the Kaiser Permanente Grand Court at Cherry Creek Shopping Center. We invite you to participate as a mask artist for our 10th Anniversary year! Mask kits are now available for pickup at our Denver office (address below). We are trying to keep our costs down as in years past, so if you are able to pick your mask up, we would truly appreciate it! If not, we can certainly get it to you. Please just let me know what is best for you. Also, could you please complete the attached Information Sheet and bring it with you when you pick up your mask? Thank you for considering being a mask artist again! Through your talent, generosity and beautiful works of art we are able to raise much needed funds for palliative and hospice end-of-life care in Colorado. Also, it is not our intention to exclude any artist that wants to participate. Please pass along this outreach to other artists you think might want to contribute to The Mask Project this year. I thank you and look forward to hearing from you soon! The Mask Project is the largest fundraising event for The Denver Hospice. For over 37 years, The Denver Hospice has been the leading provider of choice for-end-of life Palliative and Hospice care. As a Colorado nonprofit, we exist for and with the help of our generous community. We pride ourselves on being experts in our field; encircling those facing advanced illness with unprecedented levels of comfort, compassion and expertise. Monday – Friday Only, 8:00 a.m. – 5:00 p.m.